Hernandez was born in the U.S. to Mexican migrant workers. 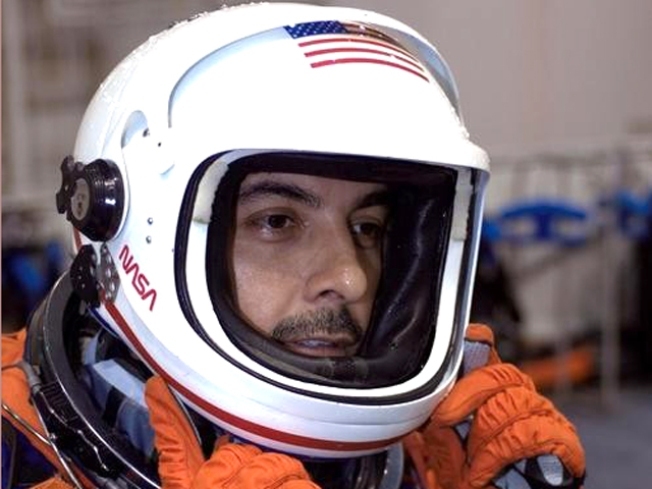 Jose Hernandez has been waiting his whole life to go to space. He'll have to wait another day. Hernandez, who spent his childhood working farm fields in California as a migrant worker, was scheduled to blast into space early this morning on the Discovery space shuttle mission. The launch was postponed due to thunderstorms, though. NASA will try to launch the shuttle again Wednesday. For nearly 20 years, throughout the 1960s and '70s, the Hernandez family would split time between Central Mexico and California. From March to November, Hernandez and his siblings would spend every day working in the fields near Stockton, California. They'd pick cucumbers, sugar beets and tomatoes. He'd attend school at a farm worker's camp, and bring homework back to Mexico so he could study throughout the year. "A lot of kids loved summer vacation," Hernandez told the Associated Press. "We dreaded it because we knew what that meant. It meant we were going to be working seven days a week in the fields." His teacher urged his family to settle in the U.S. His father eventually started a business in Stockton. Young Jose became captivated by space travel after watching a lunar landing on an old black and white TV set. He evetually got bachelor's and master's degrees in electrical engineering. But reaching his dream wasn't easy -- he received a string of rejections from NASA before being accepted as an astronaut in 2004. "For somebody who wants to go up in space, he's the most down-to-earth guy," said Graciela Duarte, Hernandez's sister-in-law. "The nicest guy, will do anything for you." Hernandez now lives in Stockton, Calif., with his wife and five children. He has been with NASA since 2004, waiting for his turn to launch.